O.A. Bauchau, J.I. Craig, "Structural Analysis: With Applications to Aerospace Structures"
The emphasis is on clarity and unity in the presentation of basic structural analysis concepts and methods. The equations of linear elasticity and basic constitutive behaviour of isotropic and composite materials are reviewed. The text focuses on the analysis of practical structural components including bars, beams and plates. Particular attention is devoted to the analysis of thin-walled beams under bending shearing and torsion. Advanced topics such as warping, non-uniform torsion, shear deformations, thermal effect and plastic deformations are addressed. A unified treatment of work and energy principles is provided that naturally leads to an examination of approximate analysis methods including an introduction to matrix and finite element methods. 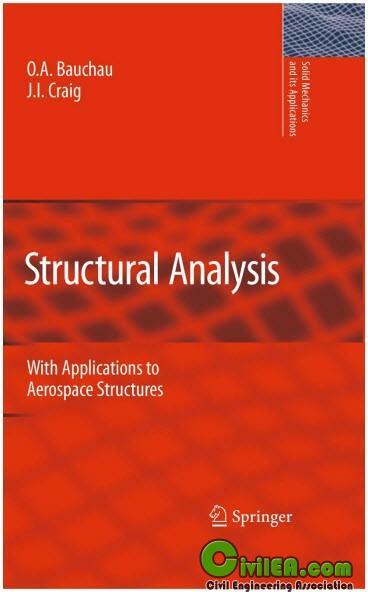 This is a textbook for teaching structural analysis of aerospace structures. It can be used for 3rd and 4th year students in aerospace engineering, as well as for 1st and 2nd year graduate students in aerospace and mechanical engineering.